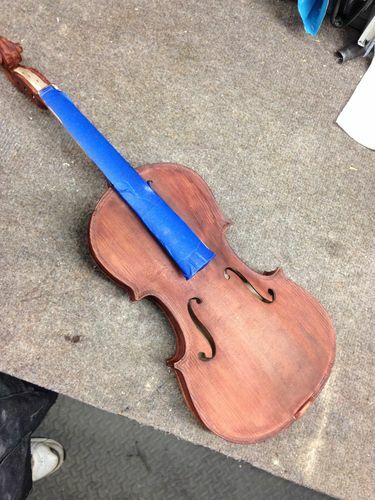 I finall got to the point where I feel I’ve finished the finish on this kit violin. I used water base mahogany stain and water base polyurethane. Purists will definitely not approve. 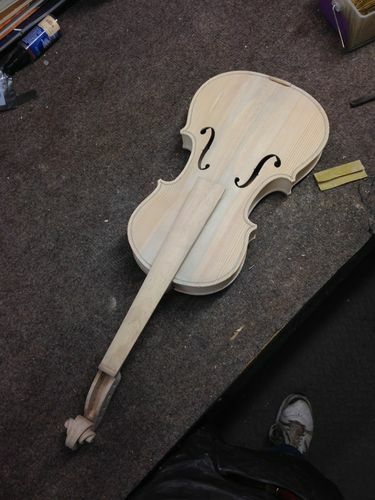 The fiddle looks aniquey and old to me which is sort of what I wanted. One of the things I’m counting on with this finish is that the polyurethane will yellow over time. This should improve the look. Plus the wood should darken a little bit. The wood for the kit wasn’t the best in any case. Nothing about it was book marched. Next I’ll be starting the set up. Not traditional, as I understand it, but that never stops me. It’s your build, do as you will. You mention not being book matched, is it common practice to use book matched and glued boards rather than a single wide board. Anyway, looking pretty good. 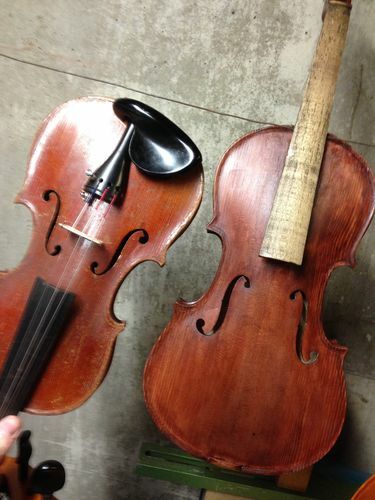 Some violins have solid plates. Some have bookmatched ones. 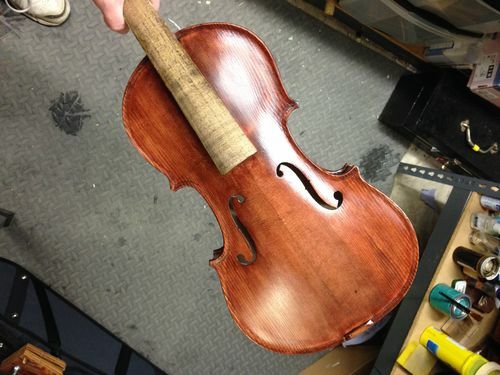 It probably depends on the maker of the instrument though I think generally bookmatched is the norm. Sounds reasonable to me. If it ends up being a wall-hanger, you’ve still learned something. The finish is looking good. Their are a lot of opinions in various articles on tone woods and finishes. I think it is in the ear of the listener more than anything. Whatever you do don’t go against tradition. I built a chromatic mountain dulcimer for my SIL and posted it on a dulcimer site. There are people out there that say a chromatic dulcimer is not a real dulcimer. I figure that is their loss. The finish is looking good. Their are a lot of opinions in various articles on tone woods and finishes. I think it is in the ear of the listener more than anything. Whatever you do don t go against tradition. I built a chromatic mountain dulcimer for my SIL and posted it on a dulcimer site. There are people out there that say a chromatic dulcimer is not a real dulcimer. I figure that is their loss. I think the 2nd mountain dulcimer that I made for the wife is chromatic, by her request. I only posted here though, so I didn’t get any flack. It’s odd though, MDs are folk instruments, so I don’t see why anyone would pretend that their form is frozen, like a violin. The folks you mentioned must get upset a lot about putting electronic pick-ups in a dulcimer, eh? It’s all music, even if it’s an old wooden crate.